Are you tired of driving a small vehicle that doesn’t provide you with enough interior space and cargo capacity? At Jim Burke Hyundai in Birmingham, AL, we have the perfect midsize SUV for all of your driving needs. The 2015 Hyundai Santa Fe has a spacious interior, powerful engine and comprehensive warranty to tackle your daily driving activities. For an amazing price on a new vehicle, visit Jim Burke Hyundai at 1424 5th Ave. N. As one of Alabama’s top-rated Hyundai dealerships, Jim Burke Hyundai serves Hoover, Tuscaloosa, Talladega and Jefferson County, AL. Stop by our dealership and explore a new Santa Fe today. The midsize SUV segment is filled with a lot of strong competition, so let’s see how the 2015 Hyundai Santa Fe does against the Kia Sorento. If you’re after a versatile midsize SUV that has the power to tackle a variety of driving situations, then the new Santa Fe won’t disappoint. The Santa Fe features a 3.3L V6 throughout its entire lineup, which makes 290 hp and 252 lb-ft of torque. 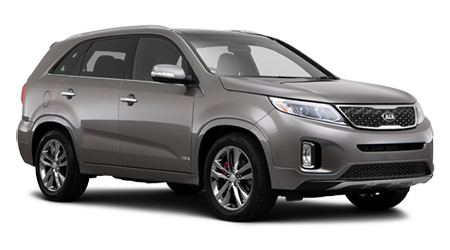 The entry-level Sorento is equipped with a 2.4L inline-four that produces 191 hp and 181 lb-ft of torque. With a more powerful engine, the new Santa Fe is capable of tackling your heavy-duty jobs. With the new Santa Fe’s spacious interior, you’ll be able to seat up to seven passengers in comfort while the Sorento is able to seat five passengers. The Santa Fe has an interior space of 160.0 cu. ft., while the new Sorento has an interior volume of 144.1 cu. ft. With the extra space, the Santa Fe provides you with more front headroom, rear legroom and rear headroom than the Sorento. As with all Hyundai models, the new Santa Fe features a comprehensive warranty that will give you the peace of mind to use the vehicle every day. The Santa Fe comes with a 7-yr./unlimited-mile anti-perforation warranty, 5-yr./60,000-mile new vehicle limited warranty, 10-yr./100,000-mile powertrain warranty and 5-yr./unlimited mile 24-hour roadside assistance. 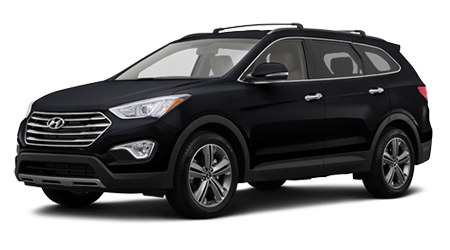 The 2015 Hyundai Santa Fe is a midsize SUV that provides you with the same usability as its larger counterparts. With room for seven and a powerful engine, the new Santa Fe has the upper hand over the Kia Sorento. Visit Jim Burke Hyundai in Birmingham, AL at 1424 5th Ave. N. for a first-class experience and test drive the new Santa Fe today.